Mars aboriginal peoples will not allow so much as a toehold. 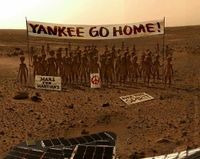 MARS, Over There -- Wary of following China's economic strategies, Martian citizens will not become the next money spigot for Americans. Short, big-headed little bastards came out in droves today to vote unanimously, to a man, against Proposition 88, which would allow Mars bankers and financiers to invest willy-nilly in America's economy. Behind closed portals, the big-headed hedge fund managers refer to it as being in a phase called, "Circling Teh Drain". In other Martian headlines, polling of the hive-mind reveals that Martians overwhelmingly desire killing all blumaroos, scientists predict travel to the eighth dimension will soon be possible, garlic is found to cause engorgement of the Phaurklanmentoo organ and dog flatulence can be lethal in an enclosed space. This page was last edited on 23 Serpeniver 2015, at 22:23.